As you enter Pondicherry, you wonder if you are in a beach town in South India or in France. The place was one of the French colonies in the country for very long time. Due this reason, the place still exhibits a significant amount of French influence in its culture, architecture, cuisine and much more. One would come across road signs in French apart from English and Tamil. A significant number of people here speak fluent French and most restaurants here also serve French cuisine. Pondicherry is a tiny place, which one can explore in one day. In case you have more time, you can relax at the beautiful beaches of this erstwhile French quarters. Have a look at some of the most beautiful and peaceful beaches of this town and visit not just one but all of them. 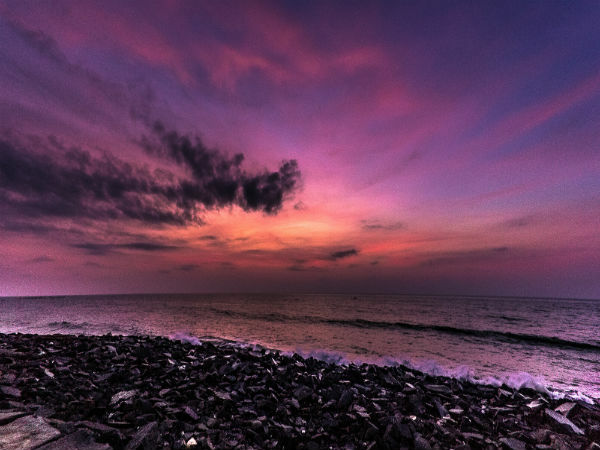 Located inside the neighbouring township of Auroville, this beach is a perfect spot for quiet soul-searching. Auroville Beach is fondly called Auro Beach and is located at a very close proximity to Auroville, a major sightseeing destination in Pondicherry. A major attraction at Auroville is the Matrimandir, which is a large meditation venue located amidst green surroundings. Auroville Beach offers golden-hued, soft sand. Let it be swimming in the sea, playing on the shore or just a stroll; this beach is the place for you to be. Draped in golden sands and lapped by the shimmering waters of the Bay of Bengal. Serenity Beach is truly a treasure chest of nature, which is secluded, quiet and obviously breathtaking. Bordered with palm trees, this beach is an ideal place for those love the waves and the shore. The beach is not overcrowded like others in the country and is a must visit. All thanks to a surf break, the waves here attract surfers from across the globe. Situated in the heart of Pondicherry, the Promenade Beach showcases a rock-lined seashore, which is the perfect location for a lazy stroll. Adjacent to the Goubert Avenue and lined with beautiful colonial buildings, the best way to enjoy the place is to walk down the 1.5 km long stretch. One would come across the statue of Marquis Dupleix on one end, a statue of Gandhi in the middle and a memorial of the First World War. Located at a distance of 7 km to the south of the town, Paradise Beach is reached via a 20 min boat ride through the backwaters of Chunnambar. The sight here is truly panoramic; one can witness the confluence of the Chunnambar river into the Bay of Bengal. The beach has clean sands and shallow waters, which make it perfect for those who want to go for a swim or simply relax. One can find a small shack which serves snacks and refreshments. The beach is given an island-like appearance due to the presence of a sand bar, which extends further into the sea. Located 7 km away from the main town of Pondicherry is the tiny hamlet of Veerampattinam; Veerampattinam is home to a lengthy, peaceful beach. The beach is well known for its attractiveness. It is also a fishing shore; hence, one would be able to find a large number of fishing boats and nets from the beginning of the shoreline to the end. The soft sands of the beach tempt every visitor to take a stroll across the shoreline and overlook how the fishermen here use traditional fishing methods.